National Weather Service map shows low temperatures forecast for Friday night. A cold storm system passing over Nevada is expected to bring unusually low temperatures to San Diego County on Friday and Saturday night, with frost possible in the valleys and lower deserts. 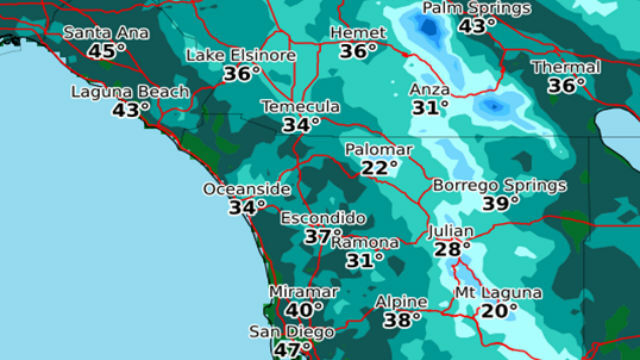 “There will be the possibility of frost for the valleys and lower deserts with temperatures in the 30s there, and only in the 20s in the high desert and teens in the mountains,” the National Weather Service office in San Diego said. The cold weather will be preceded by gusty winds beginning Thursday night and continuing into Friday. Highs on Friday and Saturday will range from 63 near the coast to the mid 50s near the foothills. Lows will range from the mid 30s to upper 40s along the coast to the low 30s in the valleys. The unusually cold conditions may continue Sunday night as well.